If you have any problems ordering through any of these websites, or if you find others that give deals as good or better, please email me at rjhoffman@yahoo.com and let me know. You're also invited to check out chapter 8 of my book Retire and Travel - 20 Years Later, entitled Reducing Medical Expenses. There, I go into various approaches to saving on medical insurance, alternatives to consider, what I'm doing, and of course, Mexican and Canadian Drugs. 2011 Update: I recently learned more about Walmart vs Walmart vs Costco. I went to buy a 90-pill prescription of Simvastin (Cholesterol reducer) at Walmart in Florida and learned it was $48. Instead, I got it from the VA for $24. Later, I found that at Walmart in Fort Payne, Alabama, it was only $12. When I asked Walmart, they said that their prescriptions are different prices at different locations. Here's the Zinger! I later checked Costco and found I could get a year's supply, 360 pills, for only $25! Wow! I had to drive 40 miles to Orlando to get to a Costco, but it was well-worth the trip. 2016 Update: Costco listed all their prices online in 2006, but now I go there and can't find them. I assume they're still doing that cheap prescriptions thing, but don't use it myself. Regarding the Canadian links, I've not used them either, but the websites have been there for over 10 years, so maybe they're reliable. If you're like most of us, one of your major expenditures during retirement is generally for prescription drugs. The prices are high now and going higher every year. In 1999, I happened to be in Yuma, Arizona and happened upon a little town named Algodones, Mexico, just down the highway a little and across the border from Yuma. In Algodones, I found that all types of drugs, prescription or over-the-counter, were much cheaper than in the good old USA. I also found that, at that time anyway, you could get them without having a prescription with you. There was a doctor right in the pharmacy, willing and able to write whatever prescription you claimed to need. I bought a year's worth of all the prescriptions that my wife and I used at that time. These prescriptions, which cost about $1200 at Walmart, were only $300 in Mexico. You can read all about this adventure and get more info on buying prescriptions from Mexico on my Travel Log chapter entitled About Farmacia Algodones. Since then, I've done a good bit of investigation into various options for getting prescriptions drugs more cheaply than just depending upon the low prices at Walmart. I get most of my prescriptions at Walmart for $4 - CLICK HERE FOR LIST OF $4 PRESCRIPTIONS. Below you'll see logos with links for other options. 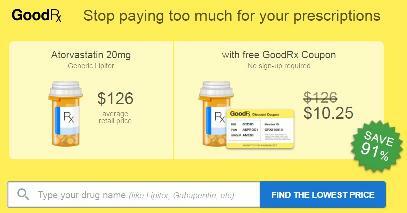 You can click on each to go check out their prescription prices. New in 2016! Click below for some great deals on prescriptions! Don't miss the coupons!